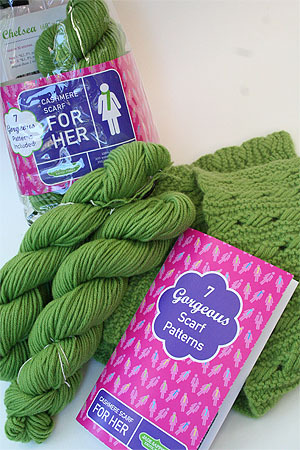 Each kit comes with enough yarn to make one scarf, but the patterns can be used with other yarns and other jade fibers - and you can mix them up, too! Jade has solved your holiday project (or gift giving) problems. 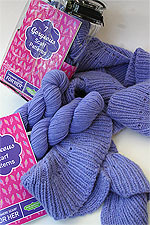 This fabulous kit includes enough of this beautiful, ultra-soft cashmere to knit up any one of 7 lovely scarf patterns (included) in a carry-along tote. For HER (Yes, there is also a HIM version) offers eight colorways in this specially spun cashmere for an elegant , perfectly delicious scarf. Lantern Moon Ebony 10" No. 9 $22.00 Lantern Moon Rosewood 10" No. 9 $21.00 Brittany Birch 10" No. 9 $7.00 Surina Wood 10" No. 9 $7.00 No, Thanks! Cashmere wool, usually simply known as cashmere, and sometimes known as Pashmina, is a fiber obtained from the Cashmere goat. The word "cashmere" derives from an archaic spelling of Kashmir. Cashmere wool is fine in texture, and it is also strong, light, and soft; when it is made into garments, they are extremely warm to wear, much warmer than the equivalent weight in sheep's wool. Cashmere is characterized by its soft fibers. It is noted as providing a natural light-weight insulation without bulk. Fibers are highly adaptable and are easily constructed into fine or thick yarns, and light to heavy-weight fabrics. The original undyed or natural colors of cashmere wool are various shades of grey, brown and white. Cashmere wool fiber for clothing and other textile articles is obtained from the Cashmere domestic goat. The goat (Capra hircus laniger) is a mammal belonging to the subfamily Caprinae of the family Bovidae. The goats produce a double fleece consisting of the fine, soft undercoat or underdown of hair mingled with a straighter and much coarser outer coating of hair called guard hair. In order for the fine under down to be sold and processed further, it must first be de-haired. De-hairing is a mechanical process that separates the coarse hairs from the fine hair and after de-hairing the resulting "cashmere" is ready to be dyed and converted into yarn, fabrics and garments. Cashmere is collected during the spring moulting season when the goats naturally shed their winter coat. In the Northern Hemisphere the goats moult over a period beginning as early as March and as late as May. In some regions, the mixed mass of down and coarse hair is removed by hand with a coarse comb that pulls tufts of fiber from the animal as the comb is raked through the fleece. The collected fiber then has a higher yield of pure cashmere after the fiber has been washed and dehaired. The long, coarse guard hair is then typically clipped from the animal and is often used for brushes, interlinings and other non-apparel uses. Animals in Iran, Afghanistan, New Zealand and Australia are typically shorn of their fleece, resulting in a higher coarse hair content and lower pure cashmere yield. In America, the most popular method is combing. The process takes up to two weeks but, with a trained eye for when the fiber is releasing, sometimes it is possible to comb the fibers out in about a week. China has become the largest producer of raw cashmere and their clip is estimated at 10,000 metric tons per year (hair in). Mongolia produces somewhat more than 3,000 tons (hair in), while India, Pakistan, Iran, Afghanistan, Turkey and Central Asian Republics produce significant but lesser amounts. The annual world clip is estimated to be between 15,000 and 20,000 tons (hair in). "Pure cashmere", resulting from removing animal grease, dirt and coarse hairs from the fleece, is estimated at about 6,500 tons. It is estimated that on average yearly production per goat is 150 grams. Pure cashmere can be dyed and spun into yarns and knit into jumpers, hats, gloves, socks and other clothing, or woven into fabrics then cut and assembled into garments such as outer coats, jackets, pants, pajamas, scarves, blankets and other items. Fabric and garment producers in Italy, Scotland, England and Japan have long been known as market leaders. In the US, the town of Uxbridge was an incubator for the cashmere wool industry. It had the first power looms for woolens and the first manufacture of "satinets". Capron Mill had the first power looms, in 1820. It burned on July 21, 2007, in the spectacular Bernat Mill fire. Recycled — fibers reclaimed from scraps or fabrics that were previously woven or felted, and which may or may not have been previously used by the consumer. The fiber is also known as pashm or pashmina for its use in the handmade shawls of Kashmir, which borders India and Pakistan. The woolen shawls find written mention between 3rd century BC and the 11th century AD. However, the founder of the cashmere wool industry is traditionally held to be the 15th century ruler of Kashmir, Zayn-ul-Abidin, who introduced weavers from Turkestan. In the 18th and early 19thcentury Kashmir (then called Cashmere by the English), had a thriving industry producing shawls from goat down imported from Tibet and Tartary through Ladakh. The down trade was controlled by treaties signed as a result of previous wars . The shawls where introduced into Western Europe when the General in Chief of the French campaign in Egypt (1799-1802) sent one to Paris. The shawls arrival is said to have created an immediate sensation and plans were put in place to start manufacturing the product in France. Trading in Commercial quantities of raw cashmere between Asia and Europe began with Valerie Audresset SA, Louviers, France claiming to be the first European company to commercially spin cashmere. The down was imported from Tibet through Kasan the capital of the Russian province Volga and was used in France to create imitation woven shawls, unlike the Kashmir shawls the French shawls had a different pattern on either side . The imported cashmere was spread out on large sieves and beaten with sticks to open the fibres and clear away the dirt. After opening the cashmere was washed and children removed the course hair. The down was then carded and combed using the same methods used for worsted spinning . In 1819 several Tibetan and Tartary cross goats where imported into France by Mr M. Jaubert under the auspices of the French government and at the expense of Mr Ternaux. Mr Edward Riley (nephew of Alexander Riley) saw the herd in 1828 and described it as a mixture of colors from brown to white, covered with course hair with an average of three ounces (84 grams) of down underneath the hair. Mr Riley also saw Mr M. Polonceau's herd, Mr Polonceau selected from the Ternaux herd and crossed his animals with a selected fine Angoras buck. In 1831 Mr Riley went back to France and purchased ten females in kid and two bucks from Mr Polonceau and sent them to Australia, at the time the average production of the Polonceau herd was 16 ounces (500 grams) of down..
By 1830 the weaving of cashmere shawls using yarn produced in France had become an important Scottish industry and the Scottish Board of Trustees for the Encouragement of Arts and Manufactures offered a 300 Pound Sterling reward to the first person who could spin cashmere in Scotland based on the French system. Captain Charles Stuart Cochrane collected the required information while in Paris and received a Scottish patent for the process in 1831. In the autumn of 1831 the patent was sold to Henry Houldsworth and sons of Glasgow. In 1832 Henry Houldsworth and sons commenced the manufacture of yarn and in 1833 received the reward. Dawson International claim to have invented the first commercial dehairing machine in 1890 and from 1906 they purchased cashmere from China, but were restricted to purchasing fiber from Beijing and Tianjing until 1978. In 1978 trade was liberalised and Dawson International began buying cashmere from many provinces.